The ancient parish comprised the townships of Isallt, Isyffordd, Pant (or Tre'r Pant), Penmaen and Rhwngyddwyffordd. Historically, until 1 April 1923, it was a completely detached portion of the commote of Creuddyn in Caernarfonshire. In 1872, part of the parish went to Colwyn; but, at the same time, it gained part of the township of Twynnan, from the parish of Llaneilian yn Rhos. Tradition states that the church was founded by St. Cynfran in AD 777. It was mentioned in the Norwich Taxation of 1254. 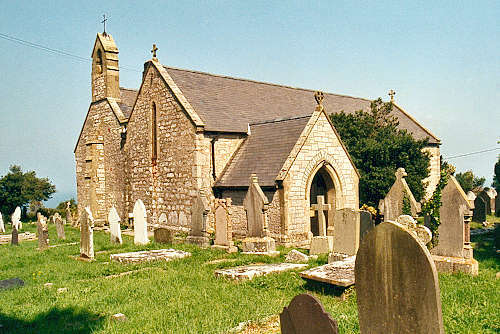 There have been several churches on the same site - the present building is believed to date from about 1377, incorporating stones from the original building. It was extensively restored in 1870. For family history information about the church and parish, visit the GENUKI Llysfaen page.